Opponents of the original SOAR effort campaigned heavily in 1998 to defeat us. Fortunately, SOAR withstood their expensive and deceptive tactics and won with a resounding 63% of the vote. Unfortunately, our opponents are back, and they’re calling themselves SustainVC. This time around, these same opponents are trying a new strategy – to divide support for the countywide SOAR initiative by pushing a competing measure to keep SOAR from getting the majority vote needed to win. If neither initiative gets 50% of the vote, neither passes and SOAR’s voter protections come to an end in 2020 – which is exactly what SOAR’s opponents want. The competing measure would end the right to vote on development projects in unincorporated areas in 2036, just 16 years after SOAR’s current 2020 expiration date. 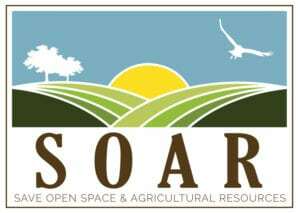 SOAR’s renewal effort would extend SOAR’s protection to the year 2050, ensuring that another generation of Ventura County residents will have the same say on development that current residents have enjoyed since 1998. In addition to cutting in half the number of years SOAR would protect open space and farmland, the competing measure creates loopholes and exemptions that will open large areas of farmland to development without a vote of the people. Far from being sustainable, SustainVC is an initiative that encourages the removal of farmland and promotes urban sprawl. SOAR 2050. If you want to stop sprawl and protect agricultural land and open space in Ventura County, the answer is simple: protect citizens’ right to vote on development.